TINA: Vogue Cover Girl At 73! From the cover: “A comeback? I need to re-invent myself. 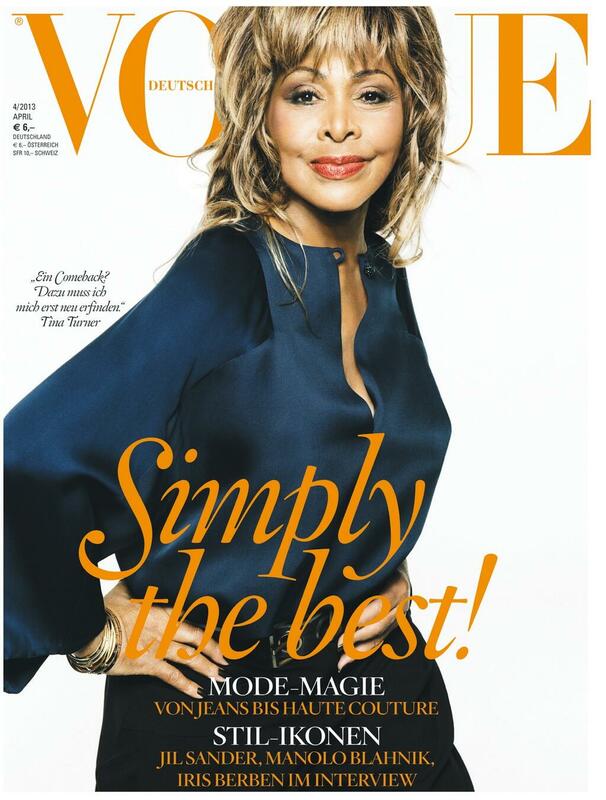 […] Tina, more than a rock ‘n’ roll icon: Tina Turner (wearing Giorgio Armani) at 73 is a marvel of serenity and joy!” Tina Turner will be on the cover of the German edition of Vogue magazine in April 2013. The issue will be on sale starting Wednesday March 13. The article is called: “TINA – more than a Rock ‘n’ Roll icon: at 73, Tina Turner is a wonder of serenity and joy for life”. First reactions to the cover inside the post. Update: Full coverage of the interview here! Update: Amazing pictures from Vogue magazine now available on their website! Read what the Huffington post thinks about it! Vogue Italy (article in English) praises Tina for her look and appearance! Wow, Tina looks great. I wonder if she is going to tour again? All I can say is ….. Re-invention? Madonna did a whole tour about that theme; the re-invention-tour 😉 . Nah, just kidding. I guess something is cooking about Tina. Time will tell. I think the translation should be… “A comeback?? For that I first need to re-invent myself” – which in my opinion doesn’t say that she is about to come back… sounds like she is leaving all options open. And as much as I am excited about this pic… the photoshopper should be fired. J’ai les larmes aux yeux. Je suis 24/7. Merci Ben & Sjef pour l’info. Haha que d’émotion effectivement Pol, enfin quelque chose! Et bien que les avis soient très partagés sur la couverture de Vogue, je trouve le résultat final plutôt convaincant, les gens ont tendance à oublier qu’elle a 73 ans et que de nos jours, une couverture de magazine comme Vogue, c’est beaucoup de taf en amont de la part du mag, et de Tina et son entourage. Et donc beaucoup de retouches également. Mais j’aime la voir comme ça et je suis content qu’elle sorte enfin de son silence! Merci pour ton com’ Pol ! She doesn’t look like herself anymore! 73 years of age??? Give me a break and fire the photoshopper! she has had a lot of work done on her face and body. lighting to completely change her skin color, air brushing, etc. i thought european magazines were much more real and accepting of women of a certain age. oh, well. You’re making broad based assumptions and they are beyond disrespectful not only to Tina, but your own intelligence. Anouk is also a great singer and perform. A huge rock/pop star in The Netherlands. Of course Tish, you’ll find every info translated on the blog! I said to myself (and I am a hugh Tina-fan!!! ): “Huh, is this Tina?? ?” Or is this pic photoshopped?? This isn’t Tina at all!! And we should wait to see the inside pictures. But still, thanks for sharing your opinion Mimyow! I have seen pics of Tina that are simular to this, the cover of all the best is one. I think people expect Tina to still look like Private dancer days or with Ike. We have to accept change. I disagree about skin lightening, I believe its lighting and newer makeup. I love it, she looks like alot of pictures if have seen of her in the past. She just looks calm and no one can accept this. Go for it Tina, you look great. I think the cover looks good. Have a feeling something is coming… Why would she do this cover shoot otherwise? Thanks for your com’ Lasse! She looks better in real life. This was not properly airbrushed. If she really did lose that much weight she may be preparing for a performance of some kind or a role. Well unfortunately we don’t get to see Tina Turner in real life that much lately but of course we know Tina never abused of surgery and looks very natural “in the flesh”. It’s a new Tina Turner “she is aged but she aged very gracefully. Yes, finally they give Tina Turner the credit she deserves! No other title than “Simply the best” could be better! Indeed a great surprise! OMG I can´t believe. I can´t wait to read it. Such a shame I can´t really read in German language, but hopefully somebody will translate it. Anyway, Tina´s pictures are going to be AMAZING. BIG THANKS to guys for this article. You are the best. I’m very happy to see this cover, no one deserves it more than the legendary Queen of Rock n Roll! Tina looks as wonderful as ever! She has aged like fine wine. By the way, I would like to thank you guys who are working on this blog. I visit it as much as I can, and since it’s basically the only online source of news on Tina these days, your effort is much appreciated!! Thanks Xtofer for your comment and for your compliments and your encouragement towards us! And let’s hope we all hear more about Tina Turner when it comes out! No woman of 73 should have this 37 year old look, done by the editors of Vogue! It is an disgrace to make such an beautiful woman into a Joker face. These editors should be fired right away!!! Shame on Vogue!!! New footage of Tina Turner might appear soon, you’ll see for yourself when you’ll see more. I don’t like the picture at all. She looks like Jack Nicolson in the Joker! No magazine, especially not Vogue, should print a picture like this of a 73 year old, like she is 37! This pisses me off! I can’t imagine that Tina LOVES this!!! What a surprise! I love the picture. I think Tina looks like a movie star. But she looks skinny in the pic. I’m nervous and excited waiting for news. Once you know something, please publish. It´s VOUGUE. It means that all is artificially perfect, not real. Everybody knows. Even 18 years old female or male models are retouched. VOGUE comes from a fashion industry, not a music industry. Tina, do what ever it is that makes You Happy! Of COURSE Tina has aged. We all do. But she has done so in such a tastefully graceful manner. She’s not 40 anymore. Some of us are just getting there. I think us “Almost 40” somethings should take a lesson from Tina and no matter your life circumstance, just try to live as beautifully and with as much tranquility as possible. ALWAYS moisturize and classy makeup is never a sin. And if you desire and can…heck get a Lifestyle-Lift! LOL. It’s all about what makes YOU feel “The Best”. And before you say it….of COURSE “VOGUE” is going to “shop” a little. But I can tell you this…Tina at 73 needs WAY less than some of these poor, hard living “stars” in their late 20’s! I know as I am rolling over a new decade, I’m already ramping up to be the best mentally, spiritually, emotionally and physically that I am personally able to be. Amo a Tina y todo que la haga feliz me parece bien, y se ve muy bien no solo en su aspecto físico(foto) si no tan bien en su integridad, y me gusta saber que está vigente. Gracias por mantenernos informados sigan así. Nice to see her on the cover of Vogue but it’s not my favorite pic of her. I wonder what the outtakes look like? Of course it’s been photoshopped as that’s the way of magazines these days regardless of the age of the person on the cover. As for what she’s working on, I saw some blurb mention something about something more for Beyond. Anyway, it’s always lovely to see Tina and I hope the images inside are better than the cover. I hope someone translates the interview as it would be nice to read what she’s up to. how do we get a copy of this German edition? Love that first shot in the dress, would have made a fantastic cover. This is like my reaction to her Vanity Fair cover. One of the best shots was relegated to an outtake and didn’t even make the editorial. I was so pissed at Vanity Fair for missing the opportunity. Oh well, Tina looks great. Whilst I am a massive Tina fan and I would really like to believe that we are going to get another tour or album….I really don’t think we are. We have to listen to what Tina has said over the last 18 months…. When the last Beyond album was launched, she said that she was ‘tired’ of her previous work and that it ‘bored’ her. More recently in the ‘Vogue’ interview she says that the last tour pushed her. Over the last 20 years, Tina has always been about creditability and I don’t think she is gonna say that she won’t tour or do an album and then go ahead and do it. That’s why I don’t think she will tour again…she doesn’t want to dilute her previous successess. With regards to a new album, again, everyone is gonna hate me, but I honestly don’t think she will record another album…..
As far as I am aware she doesn’t have a record deal and I don’t think any record company is gonna sign her for 1 album as the productions costs will potentially outweigh the return. And Tina won’t want to commit to 3 albums and remember…it’s all about profit today…the record companies may not see profit in her. People ae speaking about Bowie releasing an album at 66…but he owns his own record company. There are a few other things that lead me to think that we wont get a new album…. Firstly, I think we woulda had one by now…it has been almost 14 years. Secondly…Tina wont want to promote the album…endless flights and radio stations and tv programs…she doesn’t want to do it ! So…I think we should be grateful that we have little bits and pieces such as the Vogue magazine and hopefully we will see more things like this. Why do people think Tina has had work done why can’t a Black woman,age and look beautiful when she do,I LOVE the pic, same was said about Lena Horne,another Beautiful Black woman,I would love to buy this magazine which her copy was sold here in America…….PLEASE Tina,make another rock album and Please make a movie. Tina Turner will always remain fabulous! You go girl!